Music Director Ludovic Morlot and the Seattle Symphony welcome cellist Nathan Chan as Third Chair Cello. Chan will begin his tenure with the orchestra the weekend of March 3 with Bugs Bunny at the Symphony II. 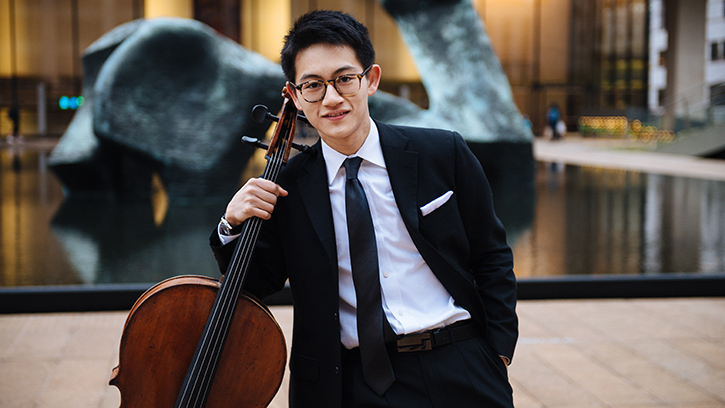 In addition to his many professional accolades, Chan is a strong proponent of using technology and media to invite audiences into the world of classical music and is committed to his fast-growing internet presence; to date, he has over 6.1 million views on his YouTube channel. Recognized for his musical talent from an early age, Chan made his musical debut at age 3 conducting the San Jose Chamber Orchestra. He has performed as a soloist with the San Francisco Symphony, The Royal Philharmonic and the Albany Symphony, among others. Chan has performed benefit concerts for many organizations, including the American Alzheimer's Association and the Friends of Children with Special Needs. For his contributions to the community, he won the Peninsula Arts Council’s Ray Lorenzato Diamond Arts Award in 2007. Chan was named a 2012 Davidson Fellow for his project entitled "The Importance of Passion” and was awarded a $25,000 scholarship as part of this prestigious honor. Chan received his Bachelor of Arts Degree in Economics at Columbia University and his Master of Music with Richard Aaron at The Juilliard School. Through the caring support of our donor family, the Seattle Symphony can attract and retain world-class musicians like Nathan Chan. Join the community of supporters who make our music possible with your donation today.